After leaving The Woods (町はずれの森, Machihazure no Mori?, lit. "Forest on the Outskirts of Town"), the player arrives at The Old Mansion (屋敷前, Yashikimae?, lit. "Mansion Anterior"), specifically the gate and the front courtyard. Upon entering the Foyer (ロビー, Robī?, lit. "Lobby"), the Mansion splits off in three different directions. On the left side of the Foyer is the Dining Room (ダイニング, Dainingu?, lit. "Dining"). Up the left set of stairs and through the door at the end of the hall is The White Room (白い部屋, Shiroi Heya? ), while at the far end is the Library (書庫, Shoko?, lit. "Archive"). In the Library, there is a false floor that hides a staircase that goes downward and leads to a door. Through that door is the Computer Room (コンピュータールーム, Konpyūtā Rūmu? 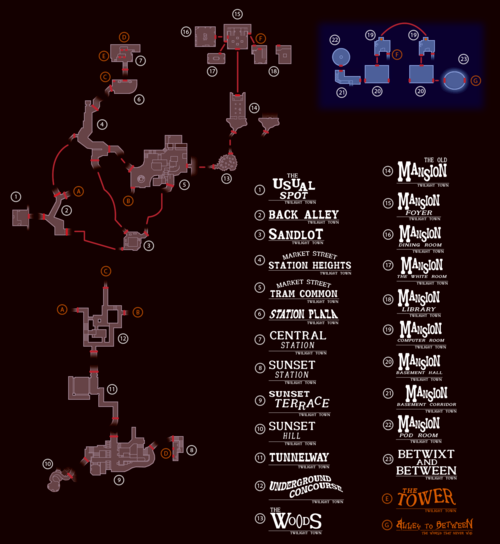 ), where Ansem the Wise monitors the simulated Twilight Town. There is a machine that allows transport into the simulation. The doorway to the left of the computer leads to the Basement Hall (地下広間, Chika Hōru?). The Basement Hall then leads to the Basement Corridor (地下廊下, Chika Rōka? ), and finally to the Pod Room (ポッドルーム, Poddo Rūmu?). In order to catch Roxas at the simulated Old Mansion, Axel creates a Corridor of Darkness from the Dark City that leads to the Basement Hall, but he never closes it. When Sora and his friends return to the simulated Twilight Town, they are able to go through the portal and travel across the emptiness of Betwixt and Between (狭間の空間, Hazama no Kūkan?, lit. "In-between Space") to enter the Dark City and begin their assault on the Organization's stronghold. When Roxas first comes to life in front of the Old Mansion, he meets Xemnas, who offers to give him purpose and gives him his new name. Xion also visits Naminé at the Old Mansion to ask about her origins; she also battles Axel outside of it. Roxas visits the Old Mansion on several missions during his time in Organization XIII. Riku and Naminé talk in front of the memory pod in which Sora sleeps. During Sora's journey in Castle Oblivion, Vexen creates a memory-based version of Twilight Town using Roxas's recollections of the world. Sora explores it and winds up in front of the Old Mansion, where he battles and defeats Vexen. The Nobody tells Sora he is naught but a puppet with false memories; Vexen is assassinated by Axel to protect Roxas's identity and obtain proof of Marluxia's plan to overthrow the Organization as Sora looks on. Some time later, Riku accesses the memory-based Twilight Town with help from King Mickey. He battles and defeats the Riku Replica in front of the Old Mansion, and within the mansion itself, Riku meets Naminé, who offers to put him to sleep in order to seal away the darkness in his heart. Riku declines the offer, choosing to confront Ansem to dispel the darkness inside his heart by himself. Roxas prepares to battle a Dusk in front of the Old Mansion. Roxas visits a simulated version of the Old Mansion on the first day he spends in the simulated Twilight Town. The Keyblade wielder faces off against a Dusk in front of the mansion's gates; he retrieves several pictures of himself the creature had stolen upon defeating it. 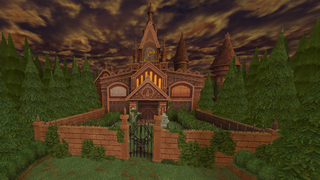 On Roxas's fifth day in the simulated Twilight Town, he visits the Old Mansion again after solving the mysteries behind five of Twilight Town's "Seven Wonders" and missing the opportunity to solve the sixth due to DiZ's intervention. There is a rumor that a girl appears in the Old Mansion's second floor window from time to time; Roxas is able to see her and realizes this is the same mysterious girl he met two days earlier. He is transported into the Old Mansion's White Room, where he learns that the girl's name is Naminé. After a puzzling conversation, Roxas finds himself back outside the Old Mansion; when he and Pence check for the existence of Twilight Town's seventh wonder, they only see a curtain fluttering in the breeze. On Roxas's sixth and final day in the simulated Twilight Town, Roxas is sent to the Old Mansion by DiZ, who rescues him from an attack by Axel by freezing time for a brief moment. When Roxas reaches the Old Mansion, he unlocks its gates using the Keyblade and enters the mysterious building. Roxas encounters Naminé once more in the mansion's White Room, and he starts to regain memories of his former life as a member of Organization XIII. Roxas is eventually able to reveal the location of the digital version of DiZ's computer; he destroys it, and in the mansion's basement, he faces off against and defeats Axel. Roxas enters the Pod Room in the Old Mansion, where he finds the sleeping Sora, Donald, and Goofy. Roxas decides to become one with his original self, causing Sora to awaken in the true Twilight Town's Old Mansion. DiZ chooses the Old Mansion as his base of operations after he successfully infiltrates Castle Oblivion in pursuit of revenge against the members of Organization XIII. He sets up a large computer system in the mansion's basement, and he also constructs the Pod Room to host the memory pods containing the sleeping Sora, Donald, and Goofy, as well as the White Room, where he allows Naminé to reside. It is from within the Old Mansion that DiZ, Naminé, and Riku work to restore Sora's memories; DiZ also creates a simulated version of Twilight Town from here in which he places Roxas after Riku captures him. After Sora and Roxas become one in the simulated Twilight Town, Sora awakens in the real one along with Donald and Goofy. DiZ, Naminé, and Riku have left the Old Mansion at this point; Sora and his friends begin their second journey together from here alone. Seeking Organization XIII's world, Sora, Donald, and Goofy eventually return to Twilight Town and head to the Old Mansion. There, they find Hayner, Pence, and Olette, who have gone to the mansion because they believe it to be the gateway to an alternate Twilight Town, from which Sora's Munny Pouch and crystal must have come. The trio also assumes that Kairi, whom they have befriended, has ended up in this second Twilight Town following her capture at Axel's hands, for they have no knowledge of other worlds. In the Old Mansion's basement, Pence activates DiZ's computer; he is able to send Sora, Donald, Goofy, and King Mickey to the simulated Twilight Town, from which they are able to enter Betwixt and Between and access The World That Never Was. Sora, Donald, and Goofy return to the Old Mansion, hoping to place Roxas's heart in the simulated version of Twilight Town. However, they find that they no longer have access to it, as Ansem's computer has locked them out. With Pence's help, they are able to create a network with the terminal in Radiant Garden so that Ienzo could use the data to research ways of recompleting Roxas. Upon leaving, they are briefly confronted by Xemnas and Ansem, Seeker of Darkness. Later, Ansem, Seeker of Darkness brings Ansem the Wise back to the mansion. Before they can enter, they are interrupted by Hayner, Pence, and Olette, who had been staking out the site hoping for clues. With Ansem, Seeker of Darkness distracted, they are able to draw Ansem the Wise away to safety. Artwork of the Old Mansion. A sketch by Naminé, depicting the symbol on the table in the library. The Old Mansion is notable for having four different command menu icons (The White Room/Pod Room, Betwixt and Between, the Computer Room, and the remaining rooms). If one goes into the White Room (or the Pod Room) in Kingdom Hearts II, the command menu icons will be styled after the cards from Kingdom Hearts Chain of Memories, while the menu itself is based off of Castle Oblivion. In Kingdom Hearts II, the Basement Corridor leading towards the Pod Room has a track containing seven other pods. The third and fourth pods were previously occupied by Donald and Goofy, respectively. However, examining the one farthest from the Pod Room states, "There's evidence this was used before." This page was last edited on 1 March 2019, at 06:56.